Our dear Mayor, Boris Johnson, thought a tin of value beans cost £1.49, when interviewed on LBC yesterday. The people did LOL. The Independent wrote an article on it and mentioned our fine fresh beans which cost £3.95 at Fortnum & Mason. 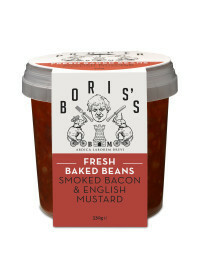 We did the only decent thing and dropped our price to £1.49 in a special limited edition Boris’s range. Just email [email protected] and we’ll sort payment. 100 pots left. All gone already, sorry!